The company is developing artificial intelligence and DNA analysis for applications in healthcare. The investment marks the first direct financing by the EIB in an Irish biotech company. Nuritas looks to identify components hidden within everyday food which can be isolated and used as the basis for new medicines. The company, whose investors include Bono and The Edge from U2, said the new funds will allow it to scale up the development of the rapidly growing company. "Future investment by the company backed by the EIB will scale up development of new therapeutics in areas of interest including anti-aging, anti-inflammatory and diabetes treatment," it added. 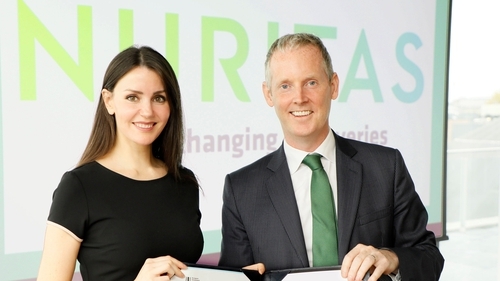 "As a proud European company, we are delighted to be Ireland's first biotech company to benefit from such insightful support which really delivers a potent signal of the regions desire to drive truly disruptive innovation," commented Nuritas CEO Emmet Browne. "We have already received outstanding and smart investment across three continents including the Irish Government via Enterprise Ireland. The European Union's recognition through this facility allows us to accelerate our existing strategy whilst also significantly broadening our capabilities in new areas such as novel drug discovery," he added. Andrew McDowell, European Investment Bank Vice President, said that during due diligence over recent months the EIB has been impressed by the company's innovative use of technology and the number of global deals already achieved. He said the company now becomes the first Irish biotech firm to benefit from the EIB's dedicated European Growth Finance Facility. "Our goal is to find innovative and fast-growing companies so that we ensure they can benefit from access to long-term financing under the new initiative and Nuritas fits this bill perfectly," he said. "This new €30m support from the European Investment Bank will enable Nuritas to expand and commercialise even faster," he added.